Nuneaton forward Gary McPhee has won the FA Cup "Player of the Round" award for the second qualifying round. McPhee scored an 18-minute hat-trick as Conference North side Borough demolished local rivals Oadby Town 6-0. The other four players nominated were Charley Hearn (Fisher), Arron Benstead (Haverhill), Craig Westcarr (Kettering) and Danny Toronczak (Ossett Albion). 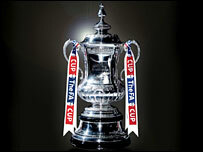 McPhee now joins Halesowen Town's Matt Lewis, from the first qualifying round, in the "Team of the FA Cup". He will also receive a VIP invitation to the 2007 FA Cup final, an engraved silver salver, and £500 worth of football equipment for a local school of his choice.